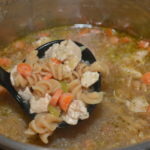 A super simple, quick to prepare, chicken noodle soup recipe that is made entirely in the Instant Pot. Healthy and freezes perfectly, this makes a great dinner whether you are sick or not! Last week, I finally made the Instant Pot plunge. I had been hearing about it for months, but honestly, never caved in due to not really knowing anything about it. It wasn’t until someone posted that they had made their dinner from frozen chicken to served on the table in under 20 minutes, that I was really hooked. I mean, wow, impressive, right? Well, I ordered mine on Amazon and two days later (thank you Prime), it arrived. Both my hubby and I were quite excited to try it out, but had no idea what to do with it. We decided to make rice the first day and let me tell you, this Instant Pot made the best rice ever. Recipe for that will be coming soon, I didn’t take any pictures since I didn’t think it would actually turn out good, haha! The rice was incredibly moist and cooked perfectly! A few nights later, we made a Jambalaya. That too, turned out fabulous. Recipe coming soon on that too as I forgot to take good pics and only have some funky colored iPhone pics that definitely don’t do the recipe justice. See a trend? I clearly need to get in the habit of photographing each recipe since so far, so good!! This past weekend, I came down with the cold that had been floating around my house for about a week. It went from each kid, to my hubby, and then to me. Needless to say, this afternoon I was out of energy and looking for a quick and easy dinner idea that would also be tasty for me while I was under the weather. After going through my refrigerator and pantry, I found the ingredients for a basic chicken noodle soup. I prepped the veggies and had this recipe ready to cook in under 5 minutes. From start to finish, the whole dinner took 20 minutes! Amazing, right?!? 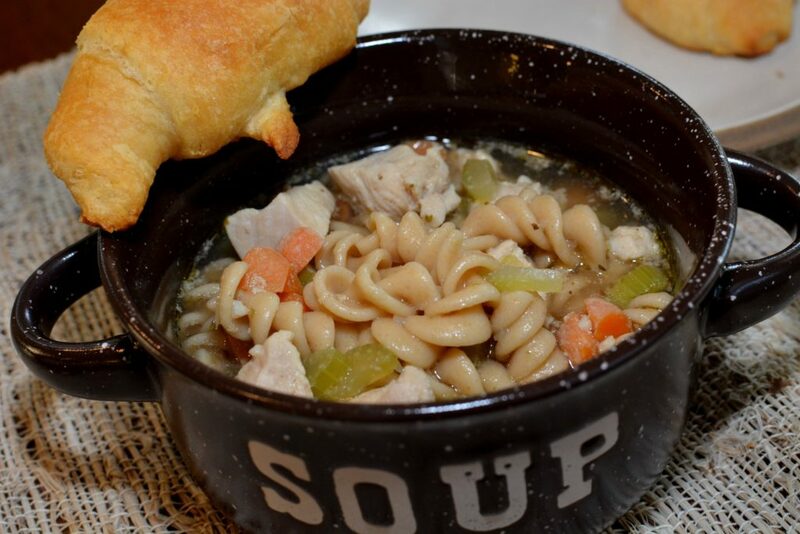 My kids and hubby enjoyed this, I didn’t have to use up any energy, and it was a soothing soup that tasted great to my “under the weather” self. If you haven’t jumped onto the Instant Pot train yet, I recommend doing so. I still consider myself a newbie at this, but already, I am in love! 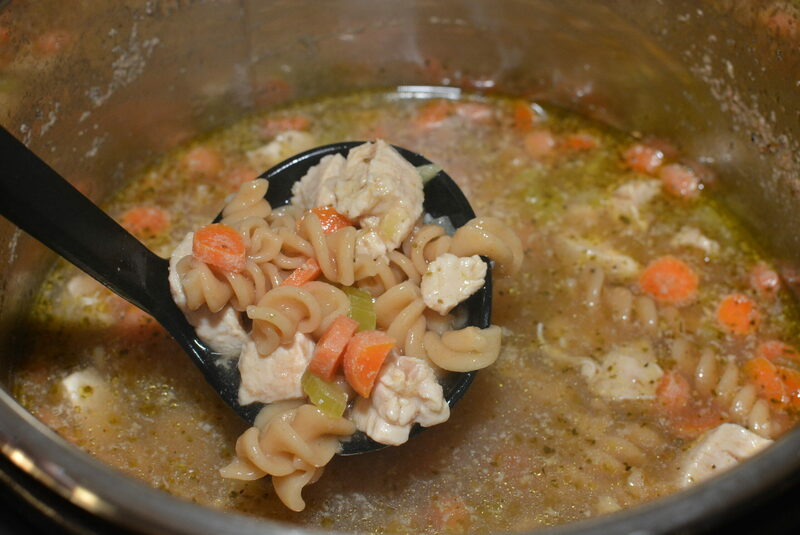 From cooked chicken in under 10 minutes, Jambalaya in 10 minutes, Chicken Noodle Soup in under 20 minutes, etc…..I now have tons of extra time in my day! Hope you enjoy this soup! Packed with veggies, chicken, vegetables, and flavor….this hearty soup is definitely perfect for a cold, Fall evening, when you are under the weather, or if you’re just in the mood for a quick dinner option! 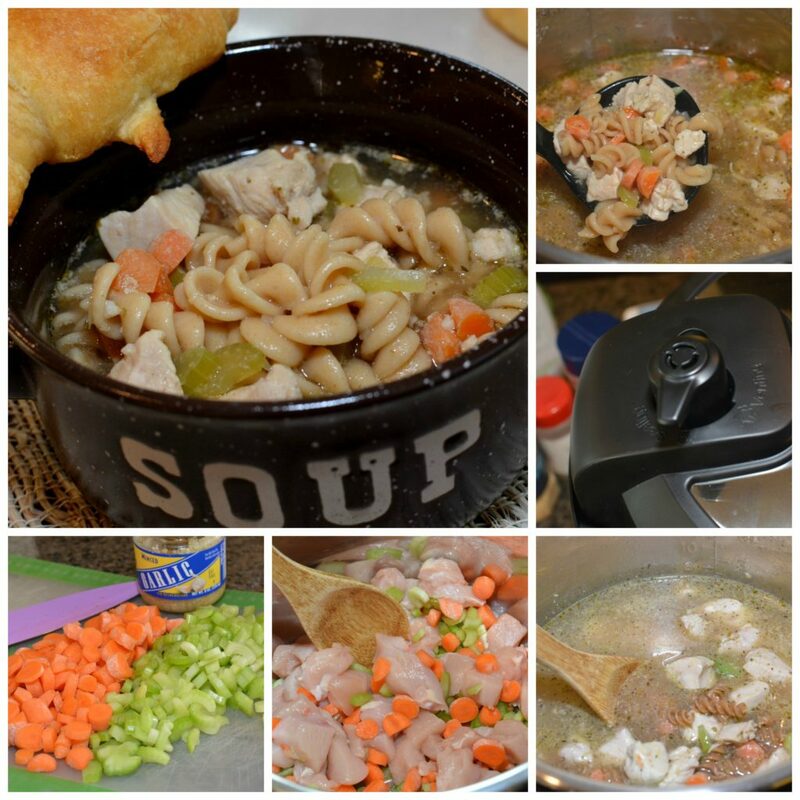 Quick to prepare, this Instant Pot soup is flavorful, packed with veggies, chicken, and pasta! Put Instant Pot on saute (low) and add olive oil once warm. 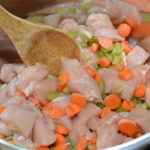 Add diced chicken, carrots, celery, and garlic. 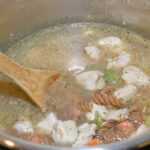 Mix around and allow to simmer for about 3-4 minutes, or until chicken is cooked slightly on outside and veggies are slightly tender. Add chicken broth, uncooked pasta, Italian seasoning, seasoned salt, and pepper. 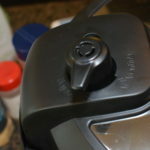 Stir and place lid onto Instant Pot securely, making sure it is locked closed. Close valve (should be on sealed) and set Instant Pot to manual, pressure, high for 5 minutes. When cook cycle is complete and beeps, allow to sit an additional 3 minutes before releasing valve. Once steam has been released, carefully open lid, stir, and serve! After much “”FEAR” – I finally did the steam thing tonight and I am ready to try a recipe tomorrow…I am thinking Rice sounds like a good place to start,too. 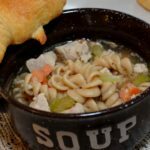 Thanks for the Chicken Noodle Soup Recipe ! Yea!!! How exciting!! I am only one week in and LOVING mine, you’ll love it too!! The steam was CRAZY SCARY for me at first, but now its the fun part haha! Let me know how the rice turns out! Hope you enjoy the recipes, stay tuned for lots over the next few weeks! !